Product #18645 | SKU RODGRIPPLUS5C | 0.0 (no ratings yet) Thanks for your rating! The RODEGrip+ for iPhone 5c from Rode is a multi-purpose mount and lens kit that is designed for use in various audio and video recording applications. The kit comes with a 2 x telephoto lens, a 180° fisheye lens, and a wide-macro lens, offering enhanced video capture for your iPhone 5c. RODEGrip+ allows you to orient your iPhone in several different ways, including handheld pistol grip style, as well as boom, camera, or desktop mounting. 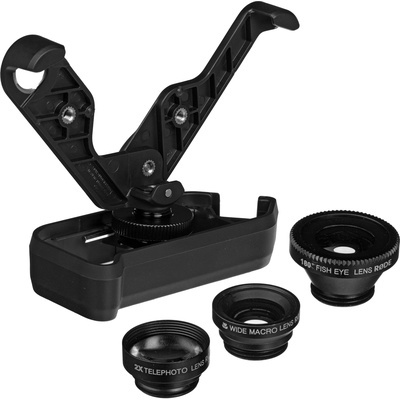 The RODEGrip+ is made from ABS plastic, and folds for compact storage and transport.